Are you like me? In love with textiles, in love with cotton, in love with flowers and all of their colors, in love with embroidery and all of its stitches, in love with jacquards and plaids and totally besotted when all this beauty comes together in a tablecloth? I think you are like me. I love to collect textiles. Tablecloths and napkins offer the prettiest and least expensive way to enjoy my most innocent of addictions. My treasure cupboards and linen closets are simply spilling in the most pretty of ways with cloths yesterday and yesteryear. They remind me of Christmas dinners, and Easter lunches, meals with friends and birthday parties, intimate tête à têtes, and boisterous family gatherings. Older softly faded cloths remind me of picnics washed in sunlight, of lazy afternoons and sleeping children. Tell me your memories of one of my tablecloths, or describe your own linen collection – even send a photo (aprilcornell@aprilcornellholdings.com) - and we will randomly select a winner to receive a free tablecloth! I L0ve my tablecloths!! The vintage white cloths with huge cabbage roses are my favorites...next would be any of my white tablecloths so I can add any color flowers, dishes and accessories i wish~and believe it or not I really have a strong connection with the old fashioned flannel backed seasonal one ~my Aunt always had a fresh one each season from the 5 and 10 cent store and I use them to remind me of her...Thanks April for your beautiful blog!! I have my very own favorite April Cornell tablecloth. And it is very precious, given to me by a very good friend to commemorate my first Wedding anniversary with my Husband. From the day that I met her, my new co-worker and I have clicked. And when I found out that she had a cupboard just spilling over with April Cornell linens, I knew we would be friends forever. She presented my Husband, and I with a beautiful pink April Cornell tablecloth to celebrate our first anniversary. It has been the center piece of every important dinner in our lives since, consecutive anniversary's, birthdays, and other special occasions. We are now going to be celebrating out 10th anniversary, and this gorgeous tablecloth looks so beautiful on the table. Thanks April, your designs are timeless, and gorgeous. For me it isn't the quantity or the quality that counts -- it's the memories. The hand embroidered table runner I received as a new bride in Ukraine reminds me of my extended honeymoon. The elephant batik from Cote d'Ivoire reminds me of toddlers running naked in a jungle garden. The paisley print from Pakistan reminds me of my Poetry Club teas. The red formal linen cloth was a gift from my mother-in-law to welcome me to the family. And the last one I bought will always remind me of touring the April Cornell factory in New Delhi. I will tell you about two of my table cloths- ones that make me think of my grandmothers. There is nothing as beautiful as the handcrocheted table cloth made by my mom-mom- it is beautiful and elegant. When my Nana passed away, I was lucky enough to have her everyday 1950s fruity kitchen table cloth. I love the kitschy-ness. It really makes me happy. Changing table cloths is like changing seasons. I have a burnt orange one for fall, a shiny green one for Christmas, an embroidered emerald one for St. Pats, a purple one for Easter, and a sunny yellow one for summer. It really can change the whole room. Linens, for me, are an obsession. I love their feel, their color, their flexibility and I love using them. After growing up with a 50's Formica patterned table (never covered) and chrome chairs, I was given my grandmother's 30's vintage oak table and 4 chairs when in college. Table linens then wandered into my life. At our local stores, tablecloths were mainly seasonal, lightly patterned, or solid. Then I walked into an April Cornell store in Baltimore on a vacation. My perspective changed! The patterns were just amazing, and there were far too many to even absorb at one time. They reminded me of the ones I had seen in Germany and Switzerland when we had visited friends there. I bought two tablecloths in Baltimore, and I was hooked. The plain ones simply didn't inspire me any longer. Since then, I have added dozens of lovely patterns and fabrics to my cupboard and absolutely love to use them. Some have been souvenirs from trips, others simply are fabrics I cannot refuse, and several have the April Cornell tag. I am so grateful for the wonderful assortment of fabrics that you place in your stores. (Although we have no April Cornell store here, I can spot your line easily in gift stores and usually end up adding to my AC collection.) Even entertaining outside, an ordinary card table is lovely set with a beautiful print cloth and napkins. Just makes me smile thinking of fun times with friends and family around tables made more beautiful with the patterns in my hall cupboard. Thanks for putting the focus on something I had begun to take for granted. Love reading what others think and realizing I'm not alone in my obsession! 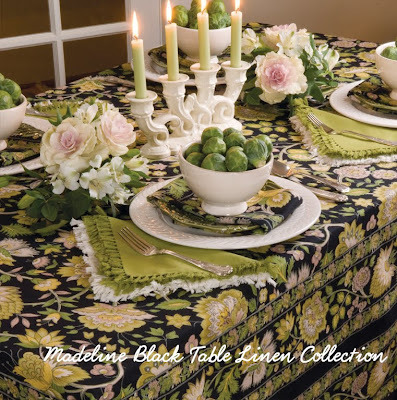 Tablecloths are one of my favorite home decor items that can be switched out by season or just on a whim. My favorites, of course, are April Cornell and I have many! Being the bargain scout that I am, I have snagged mine on clearance, at April Cornell outlets, and even some at yard sales! I use them outdoors in the nice weather and indoors on my kitchen and dining room tables. Guests always compliment me on them, and I, in turn always pass the compliment on to April Cornell by letting them know about this wonderful brand! It is so hard to pick a favorite because I have one for every season out of the many I own. The black holly. black apples, pink and red roses, blueberry. So many I love! I always look forward to my next one. The table always looks spectacular and I get so many compliments. All because of you. I love tablecloths and napkins. This came from my grandmother and aunt, both from scotland. They would always have a tablecloth on the table. My grandmothers were ones she embroidered. Muslin with beautiful thistles embroidered all along the edges. A few years ago you brought out a linen line that had the same idea....thistle embroidered on the tablecloth and napkins. I was hooked. I only have two towels from my grandma with the thistles embroidered on them. 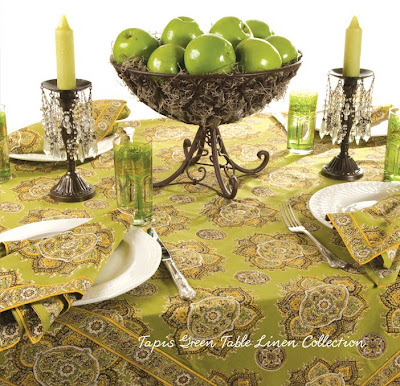 They are treasures and everytime I use the tablecloth set I bought from La Cache, it reminds me of her dining table. My aunt introduced me to April Cornell linens. She loved your tablecloths as they reminded her of the flower gardens back in Scotland. She always remembered the large flowers, cabbage roses, etc that my grandmother had in her garden. She introduced me to you in the early '80s and I have some of your early patterns that she bought from you in Montreal. I will NOT tell you how many tablecloths I have of yours, but they do go back 20 yrs. Thank you for a beautiful blog. It is nice to remember and even nicer to enjoy those memories. Yes, I too am obsessed with April Cornell linens! I have a second home in Maine and there was an April Cornell store at the outlets for a while and I went EVERY Saturday morning before hitting the beach and never came home empty handed! My favorite memory wrapped in April Cornell linens was one evening when I planned a dinner on the beach, served when the full moon was rising big and orange over the ocean. My girlfriend and I set the table on the beach with a fushia and green April Cornell tablecloth and napkins, crystal wine glasses, china, silver and completed with candles (I love elegance and simplicity mixed). Needless to say, our guys were a little embarassed at first sitting there until a group of ladies walked by oohing and aahing over the beautiful setting and the guys told them it was THEIR IDEA! It was a night we all cherish well for the beauty of the table setting, the friendship and the memories. I was inspried with ensuring I used all those beautiful linens I lugged home every Saturday morning! I have a tablecloth that reminds me of Germany (a Christmas one) and one of Portugal, where my parents are each from! Those are my favourite ones!